The historic Stillwater River flows gently into Dayton, Ohio. Its scenic shores are protected by the Army Corps of Engineers, the Ohio DNR and the Ohio EPA. When the Montgomery County Board of Commissioners wanted to replace an existing sewer line, these government bodies carefully scrutinized the replacement method. Over the years, a high water table had led to significant infiltration of the existing 27-inch sanitary sewer line. R.B. Jergens Contractors, Inc. of Vandalia, Ohio was awarded the primary contract to install a new 30-inch line just a few feet downstream from the existing line. This project was just part of the overall upgrade of the entire sewer line in the area. The original installation plan, approved by the regulatory bodies, was to temporarily dam the river twice, once upriver at an existing natural overflow point in order to reduce the flow and once again just upstream of the installation point. This would allow the contractor to open cut the river bed and install the new pipe. To protect the new pipe from river scouring and erosion, a riverwide-length gabion basket filled with four-and six-inch river rock would be placed around the new pipe. Because of the potential environmental degradation from the open-cutting method, stiff requirements were placed in the bid to forestall tree damage and hill erosion. R.B. Jergens' staff went looking for an alternative to open cutting and found Midwest Mole, Inc. of Indianapolis. 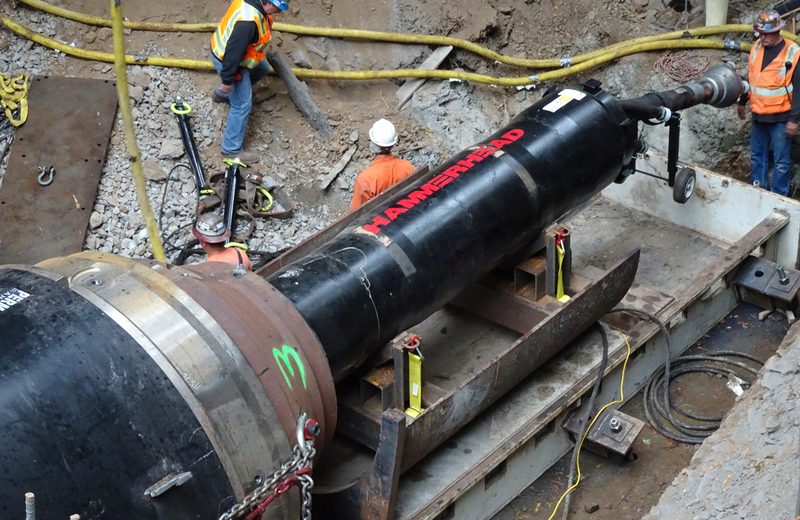 This company supplied a more environmentally friendly plan - pipe ramming a casing for the gravity sewer line under the river bed using a 23-inch HammerHead Mole pneumatic tool. "Pipe ramming with the HammerHead Mole tool was able to accomplish what no other method could," stated Len Liotti, owner of Midwest Mole, Inc., located in Indianapolis. Liotti's crews had plenty of experience installing underground casings. They had used a variety of tunneling methods over the past 17 years, working with auger boring and more recently with pneumatic pipe rammers. Liotti was confident that his 23-inch Hammerhead Mole® tool could put a 48-inch casing under this river to house the 30-inch carrier pipe since he had been using the tool to ram in a variety of large-size casings under railroads throughout Indiana and Ohio. "The ground conditions under the river bed were a combination of clay, loose sand, gravel, cobblestones and 30-inch-wide limestone boulders. We discovered the boulders when we cleaned the spoil out of the casing," explained Liotti. "We expected different conditions than when we use the Mole to ram casing underneath railroads line. There we expect to run into rail ties and rock floaters that the track builders used as ballast." To install the 48-inch casing on grade, R.B. Jergen's crew carefully prepared a launch pit on the east side of the river. They dug a launch pit 14-feet below the level of the river bank. The pit was then carefully protected against collapse with trench-box shoring. The plan called for the crew to ram the casing almost level with only a 3-inch rise over the 130-foot length of the ram. To accomplish the grade-level ram, the floor of the launch pit had to be perfectly level. They graded the pit floor level and then poured a 6-inch thick slab of concrete throughout the sixty-foot by eight-foot pit. "This preparation took about a week," described Liotti, "but it was necessary since the carrier pipe was not going to be a forced main but rather a gravity-fed system. We had to be as accurate as possible. A thick concrete floor slab was necessary to prevent any settling or movement under the tremendous hammering of the 23" Mole. When you start hammering with that kind of impact, you have a have a solid foundation or the concrete will shear." The pipe-ramming plan called for the 0.625-inch thick casings to be set on Midwest Mole's auger-boring tracks. When each of the 43-foot-long casing sections was hammered in, the pneumatic tool would be removed from the pit and the auger boring machine would clean out 20 feet of the spoil that had accumulated inside the pipe. "Auger boring was never a consideration as a method for this job because of the saturated soil conditions under the river bed," stated Liotti, "but we used our augers to clean out the spoil. We left a "plug" of 20 feet or so of the spoil so that the free water under the river bed didn't come back on us and flood the launch pit." The ground-water table was nine feet above the casing pipe and, at locations, the river bottom was within one foot. To further ensure successful completion of the ram, a six-inch-wide cutting band was fabricated and welded to the lead casing. Not only did this band reinforce the lead casing so the front end did not deform into an egg shape during the ramming, but also the cutting band added 0.625-inch extra width on the lead casing which reduced the friction between the rest of the casing and the bore wall. To further reduce friction, a 0.5-inch lube line was welded to each section. A combination of river water and bentonite was mixed into a slurry and pumped to the front of the lead casing lubricating the exterior and interior of the pipe. The pit was dewatered and the grade of the auger bore rails were set for a very small but slightly elevated ram. The crew lowered the HammerHead Mole 23" pneumatic tool and its 48-inch adapter ring and collets into the pit. The first 43-foot section of pipe was rammed by the end of the first day. The crew then spent the next day cleaning out part of the spoil and attaching the next section of pipe which was especially made with Perm-a-Loc couplings. The crew added a weld bead over the joint couplings for extra reinforcement. In less than five days, the final section was rammed to the opposite river bank. The on-grade pipe ramming was extremely accurate with the casing slightly lower at the exit pit than planned. Since the manhole for the old line was to be abandoned and a new drop manhole installed, the deviation was not a problem. "We think that one or more of the large boulders deflected the planned path of the casing," explained Liotti. "The large casing swallowed some of the boulders and broke others which proved troublesome for the auger flights that were bringing them out. Despite the deflection of the pipe and because of the tolerance between the 48-inch casing and the 30-inch carrier pipe, differential blocks were placed raising the upstream end of the carrier pipe flow and lowering the downstream end. We were able to attain the exact grade that was needed." The third week of the job was spent cleaning out the spoil, installing the carrier pipe inside the casing and filling the annular space between the casing and the carrier pipe with grout to set the carrier pipe in place. John Fuchs, estimator for R.B. Jergens Construction, Inc., commented on the relative ease in which this casing was installed compared to their company's original open-cut plan. "The Army Corps, the Ohio DNR and the Ohio EPA were sold on any application that would keep us from open cutting this river. They wanted to reduce the environmental impact on the area. "We were really quite satisfied with the outcome," he said. "Pipe ramming saved us from using open cutting, which not only would have been environmentally sensitive, but messy. And restoration costs would have also added to the project."